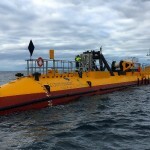 The world’s most powerful tidal turbine, developed and manufactured by Scottish engineering company Scotrenewables Tidal Power Limited, has been installed on its moorings for the first time at the European Marine Energy Centre’s Fall of Warness tidal test site in Orkney as part of site commissioning and testing. 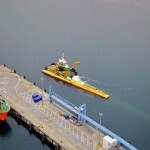 The 2MW ‘SR2000′ floating turbine was towed to site by Green Marine’s vessel the Green Isle. 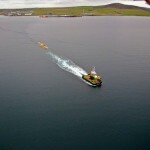 Leaving Kirkwall at 9am on 12th October, the device was connected to its moorings at the Fall of Warness by 3pm. Adhering to engineering a low cost, low risk approach to their turbine solution, Scotrenewables completed all site construction and installation work for the 2MW unit, including installation of the 500 tonne turbine itself, using locally available workboat vessels. 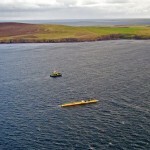 “This is a tremendous achievement for the company and, I’d venture, the tidal sector. And it has only been possible through the determination, vision and ingenuity of a small, but highly determined team that has worked relentlessly to get to this exciting milestone. “I’d also like to thank the team at Green Marine whose input and professionalism has been a major benefit to us. “This announcement from Scotrenewables is a major leap forward for the company, and one of which they’re rightly proud. “The first installation of the world’s most powerful tidal turbine is yet another milestone for the sector in Scotland, and shows that with determination and skill even a small team can produce amazing things.